Frescobol Carioca has reason to celebrate. Not just because the Brazilian beachwear brand hails from one of the most sun-soaked spots on earth (enough to make anyone smug), but because the Olympics are headed to its shores. To celebrate Rio 2016 the brand has launched the Games Collection, which includes all new all-over prints that capture the vibrant spirit of the place nicknamed “The Marvelous City”. Available at Frescobol Carioca, priced £150. When the worlds of fashion and art collide the result is usually a well-dressed one. Case in point, premium retailer Cos has produced a limited edition T-shirt celebrating four years of partnering with London’s Serpentine Galleries on on a series of live events throughout summer. Proceeds from the sale of the tees will be donated to the Serpentine trust. All your mates are tying the knot and that means one thing – no not stag dos – buttoning up in something fancy. One colourful way to conform while amping up the sombre suit is by calling in a floral shirt. This season’s prints are darker and more masculine than ever before – pick right and you can even sidestep the tie. You might have learnt how to beat the heat in the day, but as the sun sets don’t be left out to freeze. Use a dependable cardigan to layer up on cooler evenings. Reiss’ shawl collar collegiate-inspired style is a perfect off-duty addition to that capsule wardrobe we’re all supposed to be building. Available at Reiss, priced £125. The word ‘staple’ is thrown around freely in menswear, but chinos turned out by Club Monaco are essential for casual summer dressing season after season. We mean it. Pair the warm-weather alternative to jeans with anything from a blazer to a white tee. Available at Mr Porter, priced £80. In the 1950s, two things were big: souvenir jackets and Cuban collars. If you’ve been keeping up with what’s been happening in men’s fashion, you’ll know both these pieces are having a moment again. It makes sense, then, that Topman has paired the elaborate-looking details of one with the old-school charm of the other to end up with this. Available at Topman, priced £32. Eating lean and clean isn’t nearly as hard as it used to be. Just take a look at Instagram – everyone is doing it. New-to-ASOS vegan bag brand Matt & Nat should be enough to suppress carnivorous cravings. Its minimal Paxx backpack with dual zip closure pockets has enough room to strap in a 13″ laptop. Plus it comes in a sleek olive shade, so you can say you got your greens either way. 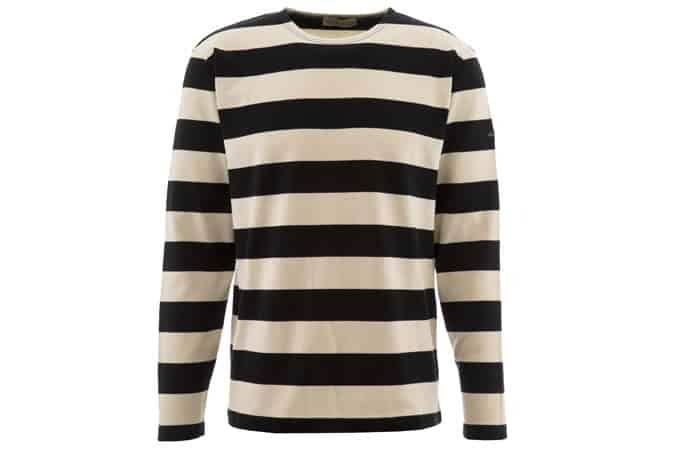 Based in the French region of Brittany, Armor Lux is one of the only authentic Breton stripe manufacturers and is, as such, a bastion for workmanship and quality. The signature pattern remains a core piece of its knitwear collections, like this example in modern black and white, made from fairtrade fabrics. Strap in, this season we’re endorsing the sandal. And it’s not just us – everyone from Margaret Howell to Maison Margiela is backing this much-maligned style. Tread with caution and hunt down a pair that come packing Italian swagger in premium materials like leather. Oh, and get any gnarly-nailed hooves seen to first. Available at John Lewis, priced £50.